Home > Light Duty V Belts > Gates Powerated V Belts. 3/8" thru 5/8" Widths. 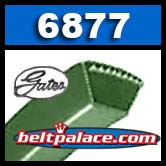 > Gates 6877 PoweRated V-Belt. Kevlar. 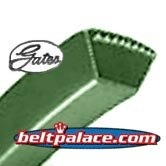 6877 Gates Powerated V-BELT. Kevlar (Aramid) cord. Gates 6877 PoweRated V-Belt. Kevlar. Gates 6877 PoweRated V-Belt. Premium Kevlar OEM brand. 1/2" Wide x 77 inches O.C. NOTE: This is NOT a BladeRunner Belt: Use Part # 6877BR. BANDO A75-KC UltraPower AG V-Belt (Kevlar Covered). 1/2" Wide, 77” Length OC. Replaces Standard Raw edge A75, 4L770 FHP V-Belts.